The "Mississippi Baby," born with HIV and treated with antiretroviral drugs immediately after birth, showed no evidence of HIV after two years without treatment. Now the child has detectable levels of the virus once again. It's a sad conclusion to what seemed like an extremely promising new way to treat this vicious disease. The National Institute of Health reports that the child, born in 2010 to a mother who was diagnosed as HIV positive during delivery, was started on a three-drug antiretroviral cocktail just 30 hours after birth. 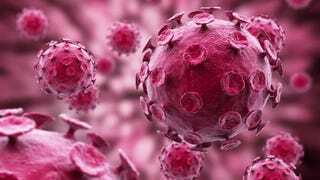 It was an unusual method, and at 23 months the child's blood samples showed no detectable level of HIV virus or the telltale immune system antibodies that indicate active infection. The child remained HIV-free for more than two years, an unprecedented length of time. However, during a routine exam this month, the child, now nearly four years old, tested positively for HIV. Genetic testing shows it's the same virus strain carried by the child's mother. The child was immediately put on antiretroviral therapy and is tolerating the treatment without side effect. This isn't the first time a patient has been temporarily "cured" of HIV, only for the virus to reappear later. Two male HIV patients who received bone marrow transplants showed no measurable virus levels for several months, though both eventually had the disease return. In all cases, it's a tragic turn of events for the patients and their families. But even if the technique wasn't a permanent cure, the fact that it cleared the Mississippi Baby of HIV for so long is extremely promising for future research. "The prolonged lack of viral rebound, in the absence of HIV-specific immune responses, suggests that the very early therapy not only kept this child clinically well, but also restricted the number of cells harboring HIV infection," Katherine Luzuriaga, M.D., professor of molecular medicine, pediatrics and medicine at the University of Massachusetts Medical School, told the NIH.